Alice Bear Shop Book Little Lost Bear Discounts Apply ! Little Lost Bear This brand new story follows the story of Little Lost Bear and his friends as they await the arrival of his family to the lost luggage office at the train station but will they come soon?. Written and beautifully illustrated by Rikey Austin, the storybooks invite children of all ages into the wonderful world of Alice's Bear Shop (and hospital for poorly bears) where the characters invariably end up either to be repaired or returned to their owners.. The re-opening of Alice's Bear Shop in October 2018 will see six titles released. Five of these six books are new versions of the original stories, where Rikey has re-illustrated Alice and the characters. 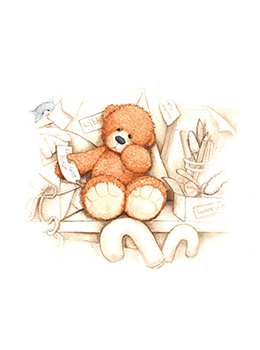 And excitingly, there is one completely new story called Little Lost Bear, where we are introduced to this adorable bear, his friends and his new family.